This species is accepted, and its native range is Philippines. Herb to ca. 35 cm tall; stem [dimensions not known]; leaves several together; petiole ca. 19 cm long, sheathing in the lower ca. fifth to quarter; blade sagittate to ovato-sagittate, peltate or not, somewhat to markedly bullate, somewhat to thickly coriaceous, dark green (sometimes darker about main reins) adaxially, paler abaxially, with the margin sometimes very shallowly sinuate, 22-27 cm long; anterior lobe widest at to ca. 4 cm from the base, the apex broadly acute to obtuse and apiculate for 0.5-1 cm; anterior costa with 2-3 primary lateral veins on each side, diverging at 60-80° and adaxially impressed; axillary glands inconspicuous; subsidiary veins numerous (i.e. ~a. quarter to half the secondary venation thicker than the rest); secondary and subsidiary venation forming rather ill-defined interprimary collective reins running, like the primary venation, into a somewhat conspicuous intramarginal vein 1-3 mm from the margin; posterior lobes acute, ea. third to half the length of the anterior, connate for 0-half of their length, the inner sides more or less linear-lanceolate; posterior costae diverging at 60-90°, with lamina to the sinus when leaf not peltate; inflorescences ?solitary to paired to clustered, subtended by lanceolate cataphylls to ca. 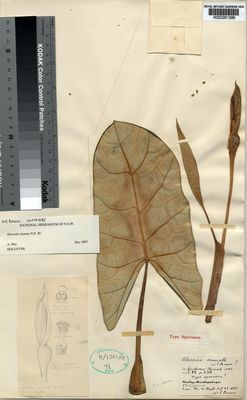 7 cm long (in the type these with reduced petiole and leaf blade); peduncle about three quarters to equalling the length of the petiole at anthesis• spathe 7-7.5 cm long green; lower spathe l.5-2 cm long, ovoid; limh broadly oblong-lanceolate, green, apiculate for ea. 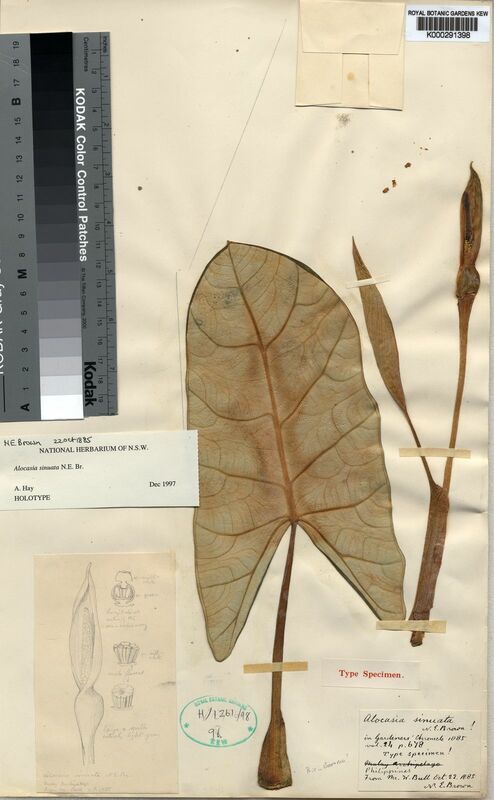 0.5 cm; spadix somewhat shorter than the spathe, 4-6.5 cm long, very shortly stipitate with somewhat oblique insertion, white except for green ovaries; female zone ea. 6 mm long, 3-8 whorls of somewhat lax pistils; ovary globose, ca. 2 mm diam. ; stigma pronounced - almost as large as the ovary, subsessile, thickly discoid to weakly 3-lobed; interstice ca. 7 mm long, the lower half of incompletely connate neuter organs, the upper half of sterile synandria, somewhat attenuate above and corresponding with spathe constriction, 2.5 mm diam. (dry); male zone 1-1.5 cm long, somewhat obconic, distally ea. 5 mm diam. ; synandria rhombohexagonal, 4-5-merous, 2-3 mm diam., thecae not overtopped by synconnective; appendix 1.5-4.5 cm long, basally isodiametric with top of male zone then tapering distally; infructescence unknown. Endemic to the Philippines- Leyte, Mindanao, Palawan. Hay, A. 1999. The genus Alocasia (Araceae-Colocasieae) in the Philippines. Gardens Bull. Singapore. 51: 1 - 41.